Chris Callaway started writing professionally in 2007 and has worked as sports editor, managing editor and senior editor of "The Racquet" as well as written for the "La Crosse Tribune" and other newspapers in western Wisconsin. He graduated from the University of Wisconsin-La Crosse with a Bachelor of Arts in English and communications. The punching bag, or heavy bag, is a staple of anyone training for boxing or martial arts. You can purchase heavy bags that come pre-filled, but it can be much cheaper to purchase an empty bag and fill it yourself. This way, you can fill it with whatever you desire, such as fabric, cloth, sand, rice and water -- the materials most commonly used for the purpose. Purchase your bag from a sporting-goods store or an online retailer. Buy a bag made of high-quality vinyl, canvas or leather, that will withstand years of abuse. Purchase the stuffing for your bag. Heavy bags normally come with up to three inches of foam padding; the amount of padding will determine how much stuffing you will need. You can cut up old clothing or buy scraps from a clothing manufacturer. Weigh down the center of your bag by filling a cylinder, such as PVC piping or a cardboard tube, with rice or sand. Fill the rest of the bag with the stuffing of your choice. If you are using cloth, add the cloth in even layers, weighing it down every couple of layers. Make sure the cloth is packed evenly all the way to the sides, as that is where you will be striking the bag. Seal the center tube and lace up the bag. 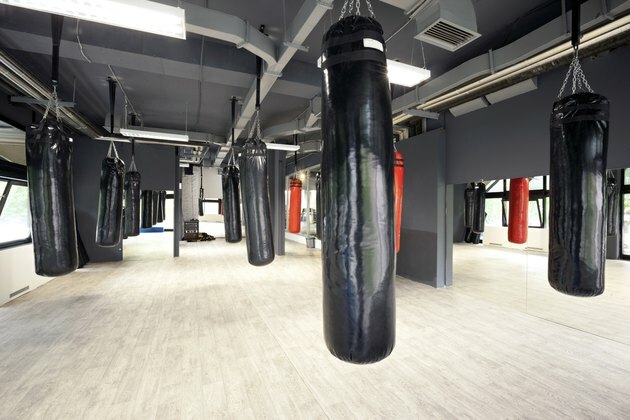 You will now be able to hang and use the heavy bag. Research exactly what you want in a bag. Go to sporting-goods stores and see what you prefer before purchasing and filling a bag on your own. Do not use a bag that is too heavy for you. You will have a much higher chance of bruising your wrists and breaking your hands.